Collapsible traffic cones are convenient to store and useful as teaching tools. Unfortunately, most traffic cone products available to consumers do not always come with this nifty feature. 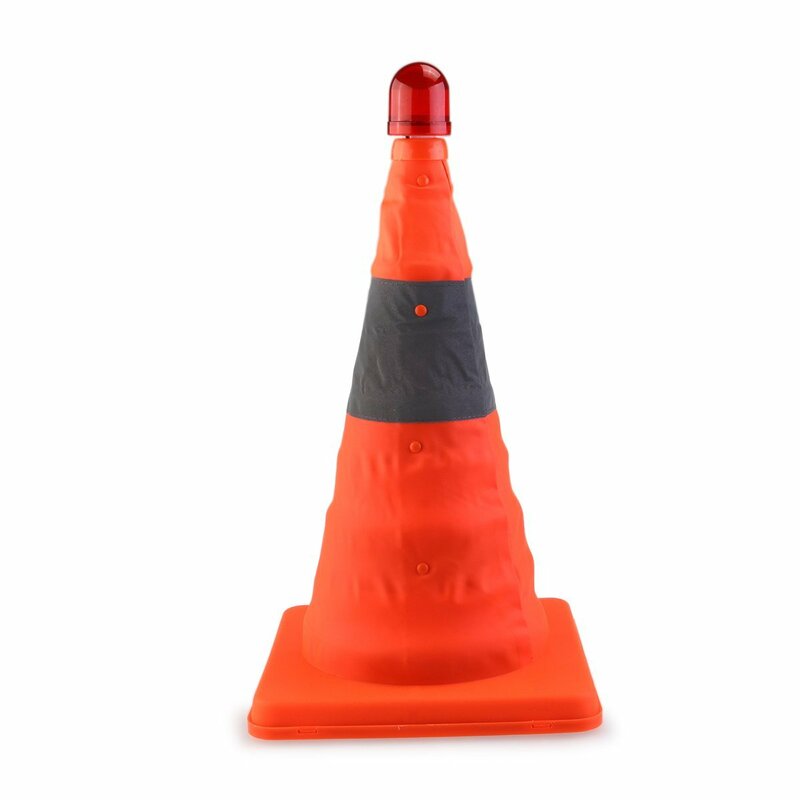 Therefore, we compiled this guide listing the best pop up traffic cones that are affordable and readily available online. You can now quickly refer to our short reviews below to find the product that best suits your needs. Go ahead and familiarize yourself with the products. At the bottom of the article, you can also find a useful buying guide for choosing the right collapsible traffic cones. How Far is the Reflective Band Visible? Size: When traffic cones are folded, they are not thicker than a small booklet. However, you might want to pay attention to how big the cone is when it’s unfolded and upright. Depending on your needs, you might need a full-size or compactly foldable traffic cone. Visibility: Is the foldable traffic cone visible to pedestrians coming 600 feet away? Traffic cones should be highly visible at night and visible during daytime at least up to 500 feet. Therefore, check the specs on the reflective band on the cone. If you want better night visibility, consider buying a collapsible traffic cone with a light. Water Resistance: This is an important feature that will make sure the foldable traffic cone can withstand the elements when left outside. 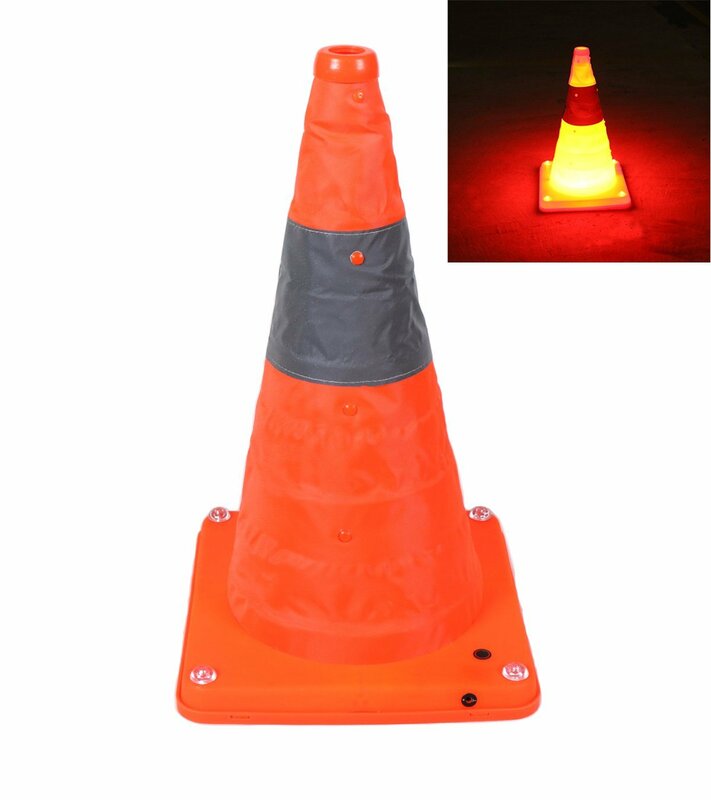 If you choose a collapsible traffic cone with a light, then it’s quite important that the body is waterproof to protect the battery compartment. The above are just the basics you need to look for when shopping. For detailed information, scroll down to read our reviews of the currently best ranking collapsible traffic cones. Why we like it: These safety cones not only collapse for storage but also have underside compartments for conveniently storing the accompanying LED light as well. Eurow traffic cones are collapsible and come with LED lights that can be attached to the top. The cones are only available singularly. This lighted collapsible traffic cone is no toy. It sports a weighted metal base to prevent the cone from tipping over easily. It comes with an LED light, of course, which is battery powered. The battery compartment is located at the bottom. The base also has a small compartment for storing the light. The cone is orange in color with a white, reflective strip near the top. The colors are matched to offer optimal visibility. Each cone is 7 inches tall. The cones meet MUTCD regulations for channeling devices and traffic cones. We were amazed by the functionality and versatility of these traffic ones. The cones are super easy to fold and unfold. A gentle push from the top makes the cone collapse on itself without any issue. Once straightened out for use, the cone doesn’t easily bend or tip over. The metal base acts as a sturdy holder. The cone is reflective up to 800 feet away. The body is water resistant and can be used in snow or light rain. The internal LED light is powered by 3 AAA batteries. The light is very bright up close. However, the brightness is not too visible from far away. Therefore, we recommend using this traffic cone with the lights on only in small areas. The light won’t be that visible from afar in actual traffic. The light is quite visible at night. It can be turned on as a stationary light or used as a flashing right. It should be noted that the light doesn’t last as long as the rest of the traffic cone. If the LED bulb is broken, it’s cannot be replaced. We highly recommend this traffic cone for use at schools, games, and recreational activities. The only disappointment is the LED bulb. Otherwise, everything else works perfectly. Why we like it: The Cartman collapsible traffic cones are not only durable and superbly designed, these are very affordable as well. The Cartman collapsible traffic cones are really colorful and vividly stand out in any setting. These cones are suitable for many occasions, including as teaching accessories. The cones come in 4-unit packs that cost less than $30. Therefore, the price per unit is really affordable, especially compared to the Eurow reviewed above. These traffic cones are designed to be highly visible. The cones are orange with a grayish reflective band. The colors are really vivid and stand out in dark settings. The cones are a bit shorter than usual and stand only at about 5 inches in height. The design overall is compact. Each cone can collapse onto itself easily. The base of the cones is made of plastic to provide extra support. These traffic cones are wonderfully easy to store. Just push a cone gently from the top to make it collapse. When in use, the cones easily pop back out, much like the cones professional construction crews use. The cones are shorter than usual. But that doesn’t mean these aren’t effective for safety use. The cones are still visible from up to 800 feet. The cones are not lighted. Yet, they can stand out in low light conditions really well. The high contrast colors can really stand out in low-light conditions. The plastic base is very convenient for storing because it’s lightweight. On the other hand, it’s also a problem. The base can be quite brittle. The plastic base may easily crack upon moderate pressure. It can withstand being hit by a car, but it’s quite prone to cracking. 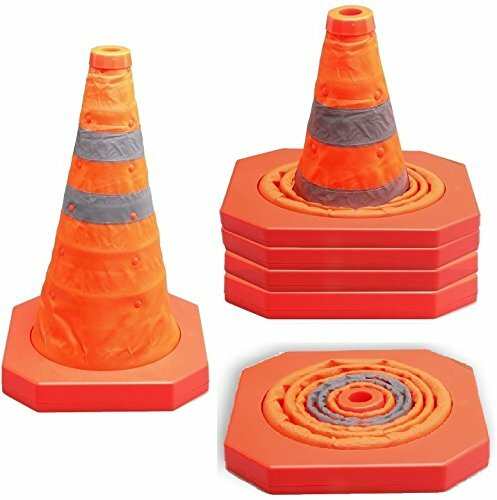 These collapsible traffic cones offer several features that are hard to beat. The design is convenient and lightweight with a quick pop-up function. The only issue we had is with the plastic base, which is not as sturdy as we hoped. Yet, this is hands down one of the best collapsible traffic cone sets money can buy. Why we like it: Though generic, this collapsible traffic cone is has a simple pop-up function and comes with a very affordable price tag. This is the least fancy collapsible traffic cone we found. But that didn’t mean it wasn’t any good. In fact, we found this rather generic pop-up traffic cone to be highly suited for roadside, emergency safety, and childcare safety. The price tag per unit isn’t bad either, especially compared to similar products. 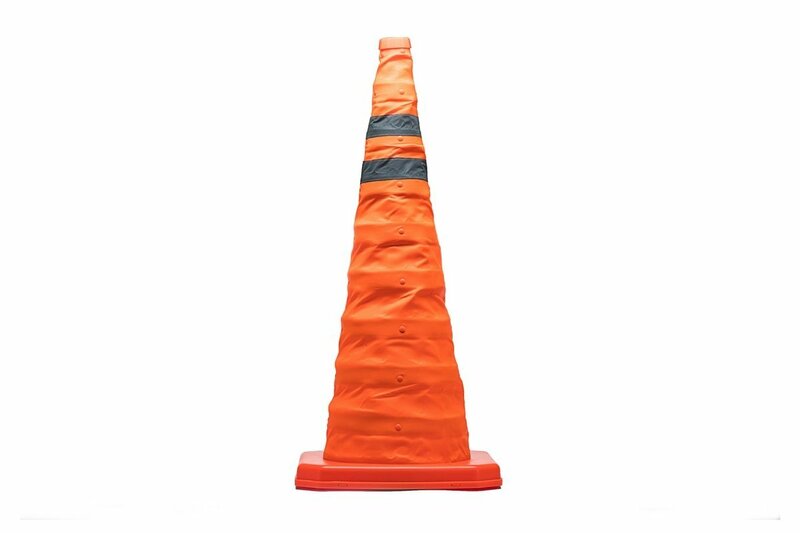 This is a large 16-inch traffic cone suitable for traffic and road use. The cone can be collapsed down to just 1.5 inches. The tall design is very rigid and sturdy. It’s made to stay in place without getting knocked over by the wind. 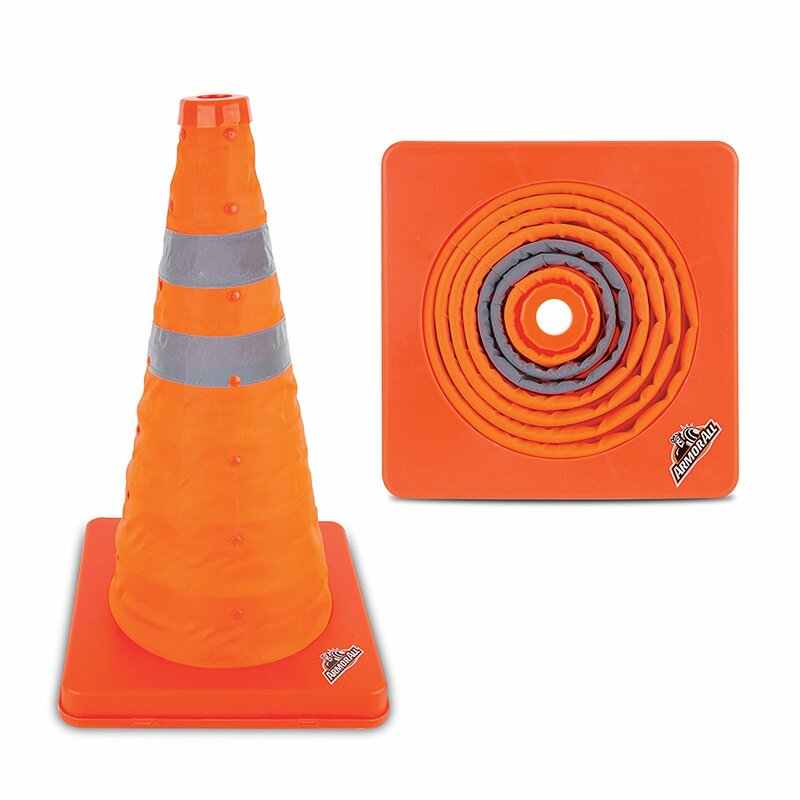 Each cone sports a high visibility orange color. The cones also have reflective bands in a grayish color. Additionally, the traffic cone is weatherproof. It will not get blown away by a gust or stop working after a bit of rain. We definitely found a winner with this traffic cone. It’s large in size, so no one will miss it up to a kilometer from afar (or even more). This cone comes in an orange shade that is highly visible like the shade of cones used by the police. Traffic cones this large are typically a major pain to carry around. But these cones collapse wonderfully to a square shape that is only a little over an inch in height. Carrying is highly convenient as a result. The collapsed cone isn’t weighty at all. This traffic cone is promoted as something suitable for use in schools, playgrounds, parking areas, and work sites. Yes, technically it is quite great for safety use. However, it’s not road-safety approved so we cannot recommend it for use in serious traffic situations. One big problem is that this traffic cone is not weighted. It’s really lightweight, which makes it easy to carry, but not for holding up. It can tip over easily with a gust of wind or small impact like brushing against a leg. That can be problematic when used outdoors. We really liked the tall and lightweight construction of the collapsible traffic cone. It’s super compact when actually collapsed. However, it’s not well weighted. That takes away some of the sturdiness a cone of this size should have. Why we like it: These traffic cones are easy to pop up and have a red light inside. The lime colored body gets transformed to orange when the bulb is lit. 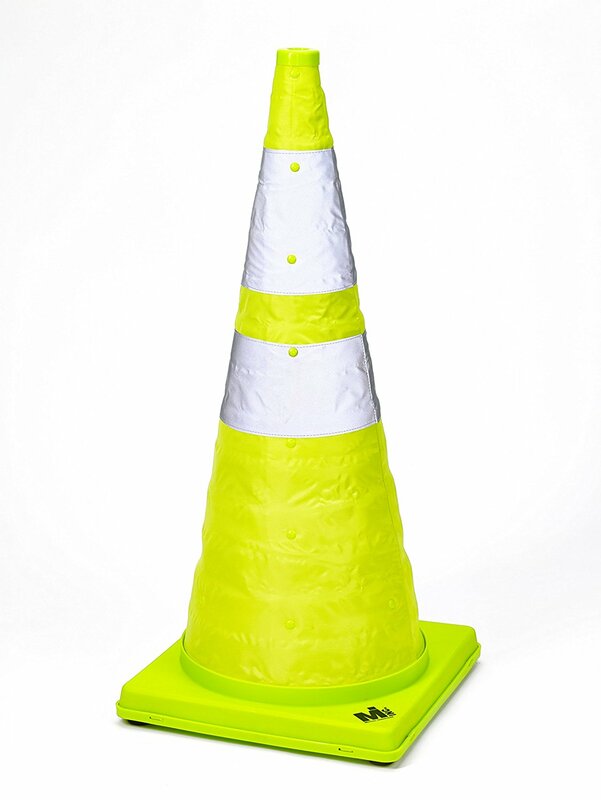 These collapsible traffic cones with light immediately stand out because of the lime color. What’s more, the cones are standard sized and suitable for traffic use. The traffic cones have a very reflective lime colored bodies. These almost glow in the dark. The cones are massively tall at 20 inches. Plus, there’s an LED light inside to make the cones even more visible at night. This traffic cone is easy to like thanks to the lime colored body. We found it more suitable than orange to be reflective at night. The cones are weighted down, so they don’t tip over easily. But the way the cones are weighted is quite unique. Instead of a regular plastic or metal base, these cones have a plastic bag filled with sand inside. That keeps the bags upright unless someone kicks the cone over. The problem is, the bags can rupture and spill sand everywhere. If the cones are accidentally dropped or run over, the plastic bags would rupture. Other than this peculiar weighing method, the cones are well-constructed. The body collapses much like the other traffic cones on this list. Because of the sand, these cones are not lightweight to carry. However, they easily collapse into a small and compact shape. The LED light is powered by two AAA batteries. 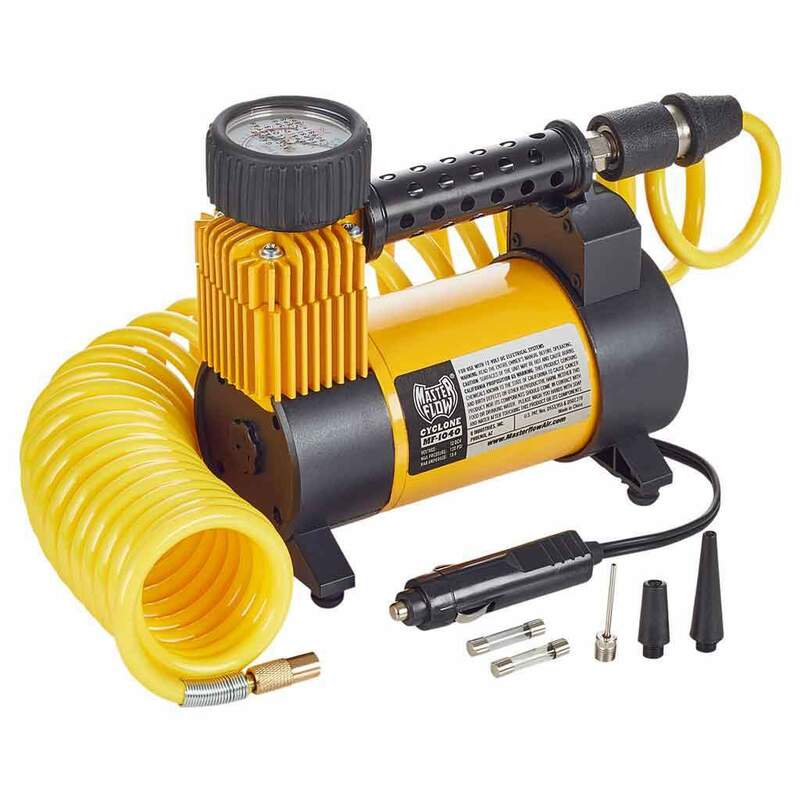 The illumination can be switched between flashing and steady. The illumination is great at night. But we found the bulb to be not as bright as it should. Keep in mind that the bulb is made up of a single small LED light. When illuminated, the red bulb inside would make the cone look orange. That’s a really cool feature in our opinion. The sandbags aside, these traffic cones are well-made with a cool color-changing ability. The price per unit is not too cheap. Considering the features on offer, we say the price is well worth it. Why we like it: This traffic cone not only folds easily, it has 5 LED bulbs with a rechargeable battery. The Top Yao traffic foldable cones are unlike anything we’ve seen before. These traffic cones are lighted like most, but also have very high-tech charging solutions. 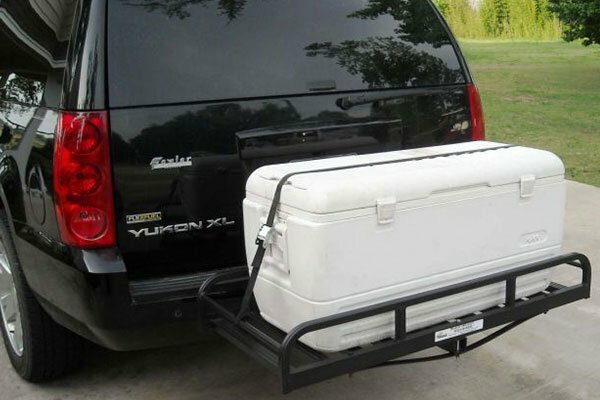 These are designed to be portable and collapsible for easy storage mainly at home. But these can be useful for schools, offices, and workstations as well. This pop-up traffic cone is up to 10 inches in height. But once folded, it’s only about 2-inches thick. The traffic cone is designed to easily pop out and be able to fold. But that’s not the key feature of this collapsible traffic cone. The biggest feature is the rechargeable power source for the LED bulbs. There are up to 5 LED bulbs on this traffic cone. All the other traffic cone lights are powered by AAA batteries. However, the Top Yao traffic cone has a Li-Ion battery inside, like a smartphone. The battery is rechargeable via a USB cable. 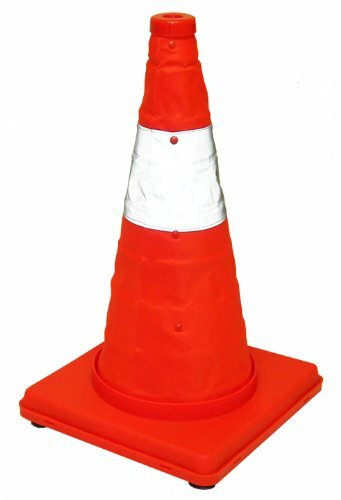 The body of the traffic cone has a standard orange color. The color is very bright and the cones also have a reflective VSB tape near it around the top. The Top Yao traffic cone is hands down one of the coolest collapsible traffic cones we have come across. Its main feature is the rechargeable bulb system. The traffic cone has a single bulb inside and 4 others outside, amounting to a total of 5 bulbs. That means high visibility. We are talking about visibility similar to a ceiling light. No one will miss the cone when out at night. The traffic cone is rechargeable via the USB cable. We could recharge the cones in the car or hat home convenient. The bulbs have three working modes: steady, quick flashing, and slow flashing. The bulbs are visible up to 800 feet in distance. The charge was decent. We could leave the cone out all night without an issue. The problem is that the inbuilt battery makes these traffic cones non-waterproof. The nylon body doesn’t protect the wiring. These huge traffic cones are not only easy to collapse but are supremely visible thanks to the 5 LED bulbs. In addition, there’s an inbuilt battery. But none of this compromises the cone’s ability to fold. These features are really great, but they come with a cost. The cone isn’t waterproof, for one. Also, the package includes only one cone and it’s really expensive. If you can overlook these issues, then this would be a great product to own. Why we like it: This collapsible traffic cone is well-lighted. It’s far superior to most other single LED bulb lighted cones out there. The Nuolux lighted traffic cone is one of the best-built products we have come across. It’s a bit pricey per unit, but there are plenty of features that are worth checking out at least. This lighted traffic cone is made from Oxford fabric. If you didn’t know, all the other products on this list have cone bodies made from nylon, which is both durable and waterproof. Oxford is a variety of nylon that is slightly thicker. The fabric is listed as a red color. However, the cone has a shade of darker, reddish orange. It’s not actually red. The cone is splash-proof. The LED bulb is placed atop the cone. It’s large and highly visible. The body of the cone also has a reflective strip. This bright orange traffic cone is very visible from afar. When erected, it’s 17 inches tall, which is standard. When collapsed, it’s as small as 12 inches in thickness. The sturdy build and the bright color are well worth the money. But what we really liked is the LED bulb. It’s larger than most bulbs found on collapsible traffic cones. It was a lot brighter and more visible as a result. The bulb itself is splash-proof, along with the rest of the cone. When folded, it fits nicely inside the fabric without jutting out. The unit is great for actual traffic control. But it does not officially meet traffic standards. What we didn’t like was the base. It’s plastic but not weighted. The bulb requires 2 AA batteries. This traffic cone is really easy to fold and pop back out. Once folded, it would easily fit inside vehicles for storage. The problems are minimal. We found it to be a bit pricey per unit. Also, the base could have been weighted. Why we like it: This collapsible traffic cone costs less than five bucks a piece, so it’s hard to go wrong with them. This traffic cone is lean and tall. It’s incredibly affordable per unit. It immediately caught our attention mainly due to the price. However, cheap doesn’t really mean low-quality for this product. 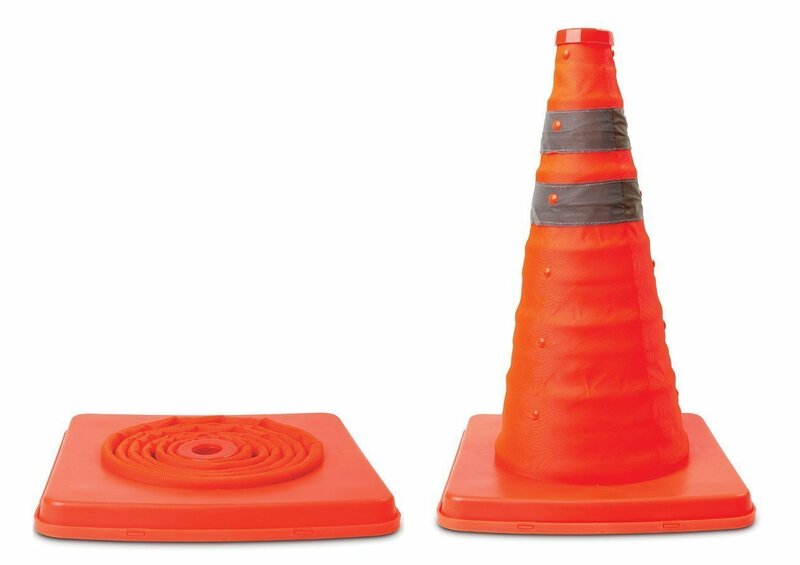 This 20-inch collapsible traffic cone with a 20-inch base is slim and very tall. It’s not necessarily the standard shape, but it gets the work done regardless. The tall structure can be collapsed to just 1.5 inches in height. There are reflective strips at the top of the cone to increase visibility. Interestingly, this traffic cone is made from polypropylene. It is a very flexible material that can double as both a hard plastic and a fabric. Therefore, the collapsible body is made from poly fabric. But the base and the other hard parts resemble plastic. There is no LED bulb at the top. Rather, there are tiny LED dots attached to each folding ring to make the cone more visible. This collapsible traffic cone comes from a relatively new brand. However, it does its work quite well. The pop-up mechanism works impressively well. The cone is easy to push in for folding and can be unfolded whenever needed. The fabric and the base make for a very sturdy material. The fabric is splash-proof and will not easily get damaged by moisture. We were not impressed by the bulb, however. There is no flashing LED bulb at the top to indicate the cone. Rather, there are multiple tiny LED bulbs along the body of the traffic cone to illuminate it at night. It adds a small glow-in-the-dark feature and isn’t very bright. Regardless of this minor inconvenience, the cone is very lightweight and easy to carry. But the plastic base isn’t weighted, so it can easily fall over. This collapsible traffic cone is much better constructed than we initially thought. It only has a few inconvenient issues that aren’t major. Considering the cheap price tag, we say this traffic cone is well worth buying. The issues are really canceled out by the price. Why we like it: It comes in a pack of 5 with a carrying bag, so you are spending less per unit than usual. This is from the same brand as the lime colored collapsible traffic cone mentioned above. It’s very similar to that product in construction and price-wise. What makes this really worth is the package. The $100 price tag might alarm you, but keep in mind that the price per unit is really kept down. Plus, the pack comes with cool carrying case. These cones are about 28 inches in height. This is the standard for traffic control cones, so you can easily use these on the road. Each cone is equipped with an LED bulb with two modes. The bulb can be set to blinking or steady. The bulb is inside the cone. The cones are orange colored with reflective strips. This is the standard color for traffic control cones. The bodies of the collapsible cones are made of waterproof nylon. We used it in light rain without any issues. The cone lights inside can burn steadily for 36 hours, or for 100,000 flashes using a single AAA battery. That’s not bad, even though batteries have to be changed several times a week for continuous use. But the lights don’t really perform as advertised. The LED bulbs are very low powered and don’t flash brightly. It’s okay for pedestrians, but not necessarily for oncoming vehicles. The 5 traffic cones are really bright, even though the lights are small. Considering the price, this is a great deal. The cones collapse well and are roadworthy, so it’s really great for people who want multiple foldable traffic cones. Why we like it: These multipurpose collapsible traffic cones are compact, highly visible, and well worth the price. The Armor All foldable traffic cones are multipurpose. These are compact enough for recreational use. Want traffic cones to take with you on a camping trip? Then this cone would be a great choice to consider. The Armor All traffic cones have a compact design. So expect a cone that is shaped very much like a standard traffic cone, but is a bit smaller all around. The cone is only 16 inches high, which isn’t too small. The body of the cone is made from bright, high visibility orange nylon. The cone has reflective lights, which increases visibility. When collapsed, the cones are very compact. These cones are wonderfully compact when folded. It would fit easily in a car or even a backpack. So if you are looking for convenient traffic cones for travelling, this product comes highly recommended from us. Overall, the build and performance of the cones are standard. There’s nothing fancy and the cones meet all the basic standards. The collapsing mechanism is very convenient and easy. Just a little nudge and it would collapse. Once straightened, it can stay rigid without an issue. We particularly liked the bright orange color. This traffic cone has no light, so the extra bright color is appreciated at night. For what it’s worth, this cone comes with a guarantee from the brand. Do note that this traffic cone doesn’t have a weighted base. This is an all-around compact, collapsible traffic cone to consider. It’s not too much but isn’t cheap for the given price either. The price per unit is somewhere in the middle. If you want a compact product, the price may seem several dollars too much. But we still recommend it for the compact build. Why we like it: This particular collapsible traffic cone is visible from 1,000 feet away, about 200 feet more than the standard traffic cone. The Lucky Line traffic cone seems very unremarkable at first. Price-wise, it’s low-to-middle end, so that’s worth it. Regardless of the lack of hype, we found several useful features that truly make this collapsible traffic cone worth possessing. This is a tall 18-inch traffic cone that is only 2 inches thick when folded. We have to say that the collapsing mechanism works really well. The color of the cones is sort of reddish orange. So these cones are darker than most others available on the market. The cones are equipped with small LED bulbs. The bulbs can blink or continuously flash. The lights are visible from all directions of the cone. The cone also has a reflective band. This collapsible traffic cone is unremarkable on many fronts, except the reflective band. It’s super bright and is visible from up to 1,000 feet away. Most traffic cones have reflective bands visible only up to 200 feet away. In that regard, this traffic cone is well worth it. It should be noted that this collapsible cone is really dark. It’s not super visible at night because of this. However, the cone is equipped with tiny LED lights all around that can flash straight for 300 hours. The bulbs do increase the visibility at night. The bulbs are powered by 2 AAA batteries, which are included in the packable. The little bulbs are a great addition but are too small to be super bright at night. The brightness issue aside, this cone is very compact when collapsed. We could keep it in the trunk and it popped up real quick when in need. We liked two things about this collapsible traffic cone: the price and convenience. It’s too dark to be highly visible at night, but it does the job of being a standard foldable traffic cone. 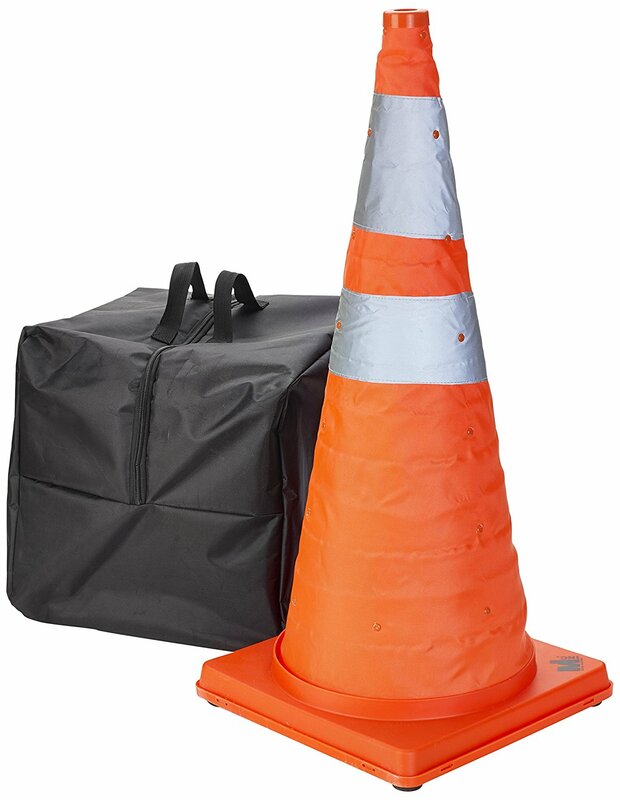 Unlike regular traffic cones, collapsible traffic cones are not usually sold in sets. That is to say, always assume the price you see is for a single product. When you are buying stackable traffic cones, you can get 5 or 10 for a price tag of $20. But with collapsible traffic cones, you can only buy about a single cone for that price. Prices can vary, of course. But make sure you understand how many cones you are paying for before finalizing the checkout. Always double check the number of units included in a package so you don’t end up overpaying. It’s best to check how big the traffic cones are before and after collapsing. For the most part, even the tallest traffic cones are only about 2 inches thick once folded. But if you want a particular size for folded products, do check the dimensions after the cone is well folded. Do you want a collapsible traffic cone with LED lights, or without? A pop-up traffic cone with a light would be more visible at night and more noticeable from a distance. Therefore, this is a feature well worth considering. However, do be aware that the lights are not equal in all traffic cones. Some have a big LED light at the top, some have small bulbs all around, and some other cones are lit from the inside. If a well-lit pop-up traffic cone is important to you, make sure you know how the lights are added to the cone. Check the number of bulbs and whether bulbs are placed inside or outside. You might want to check how the lighted collapsible traffic cone is powered too. Most lighted cones are powered by AA or AAA batteries. But newer products come with rechargeable lithium-ion batteries like the one in your smartphone. There are pros and cons to having a traffic cone with a rechargeable battery. The price, for example, would be higher. You should decide what’s most convenient for you based on your needs. Collapsible traffic cones are used outside, so always check for waterproof features. The product must be able to withstand moisture. 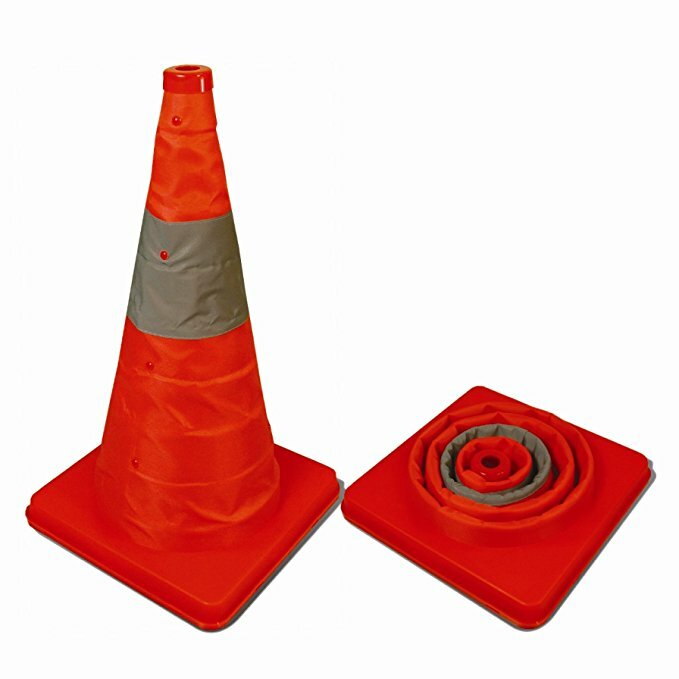 The bodies of pop-up traffic cones are made from nylon or a type of nylon fabric for the most part. 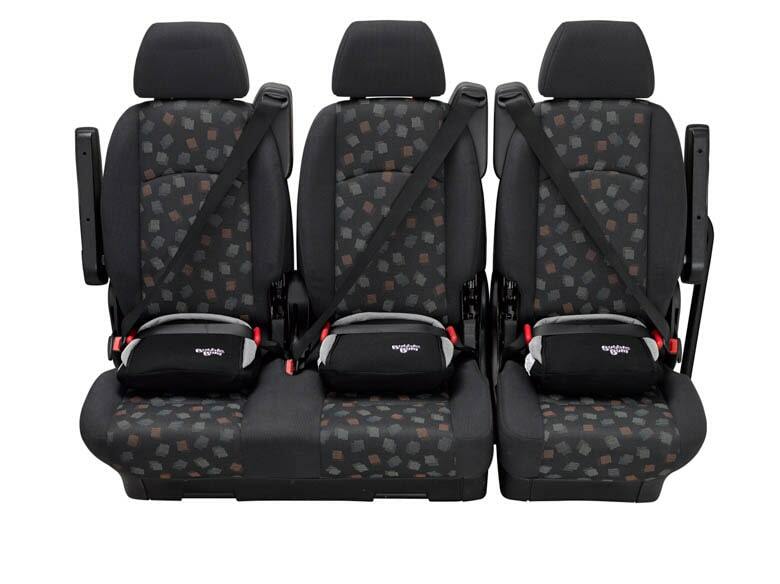 Naturally, the synthetic fabrics are splash-proof. The material would be able to withstand a drizzle. But not all cones are completely waterproof as to protect the batteries inside the lighted ones. If you plan on placing the cone on snow or wet surfaces, make sure it’s waterproof. Collapsible traffic cones are great, but only if the product can stand up straight without getting knocked over by even a small breeze. The best foldable traffic cones, therefore, have weighted bases. Weighted bases can sometimes increase the overall weight, which can be a problem if you need to hand carry the traffic cones. But the weight is necessary to keep the cones in place. Do check how the brands are weighting the bases. Some use hard plastic that adds extra weight to the base. But some manufacturers use outdated methods like sandbags, which can leak or rupture. You don’t have to base your purchase decision on this factor alone. But it should play an important role in your decision. Most traffic cones have a reflective band on the body in white or grey color. This color makes the cone visible from far off distances to pedestrians and drivers. Choose a cone with a highly reflective band for the best daytime visibility. The maker would specify if the band is more reflective than usual. Collapsible traffic cones are orange for the most part. But if you want something different, you can choose colors like lime yellow or reddish orange. So orange is not the only color available on the market. Want to use the collapsible traffic cones in actual traffic? Then you need a product that meets roadworthy standards. You will have to specifically look for this feature. Otherwise, you might get in trouble for using non-standard traffic cones on main roads.